Grounded in multimodal theory and supported by practice in the classroom, Writer/Designer streamlines the process of composing multimodally by helping students make decisions about content across a range of modes, genres, and media from words to images to movement. Students learn by doing as they write for authentic audiences and purposes. The second edition of Writer/Designer is reimagined to clarify the multimodal process and give students the tools they need to make conscious rhetorical choices in new modes and media. Key concepts in design, rhetoric, and multimodality are illustrated with vivid, timely examples, and new Touchpoint activities for each section give students opportunities to put new skills into practice. 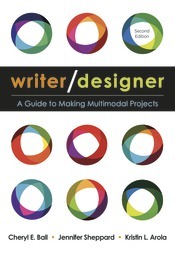 Based on feedback from instructors and administrators who incorporate multimodality into their classroom—or want to—this brief, accessible text is designed to be flexible, supporting core writing assignments and aligning with course goals in introductory composition or any course where multimodality matters.